Upon being visited by three ghosts in one night, it was Ebenezer Scrooge who famously blamed a crumb of cheese for his ghoulish encounters. 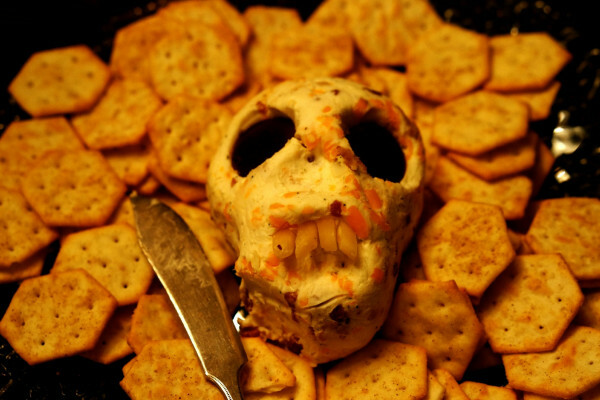 But Scrooge and indeed his creator Dickens are not the only believers in the relationship between cheese and nightmares. The supposed link between late night cheese binges and bad dreams had stood the test of time. but is there any science to back up the stories? One promising theory comes from an active ingredient in cheese known as tryptophan - an essential amino acid, tryptophan is used by our own bodies to make the chemical neurotransmitter serotonin which is being proven to play a role in mood, memory, and you guessed it, sleep. But whilst cheese may provide us with the tryptophan needed to produce more serotonin which in turn may alter sleep patterns, the specific role it plays in nightmares is less clear. Interestingly though, poultry such as turkey also has very high levels of tryptophan which may explain grandad getting a bit sleepy after Christmas lunch. While we might not be able to directly link cheese to nightmares, is there any other explanation for the food we eat affecting our dreams? Apart from tryptophan, another major constituent in cheese is fat. Apart from expanding your waistline, fat is also particularly hard for the body to digest. Because of this, consuming high levels of fat less than 3 hours before bedtime can lead to periods of indigestion and ultimately, interrupted sleep. While a restless night doesn't cause nightmares, what it can lead to is better dream recollection. A recent neurobiological study from the Neuroscience Research Centre in Lyon examined why some people are naturally more inclined to recall dreams and some are not. Aside from slight differences in people's brains, they found that those who are better at remembering dreams had more periods of wakefulness. Now, they theorise that this might have something to do with the encoding of these dreams in subconscious memory. So, it would appear that late-night eating of high fat foods such as cheese can lead to more periods of wakefulness and this in turn can lead to better encoding and recall of dreams or drum roll please. nightmares. Thus, leading poor old Ebonezer Scrooge to believe that it was indeed a crumb of cheese that brought about the ghost of Christmas past, present, and future. Previous Why are ripe pears juicer? Next Eels: a source of electricity? Why do I fall asleep in lectures? Can people dream under anaesthetic?